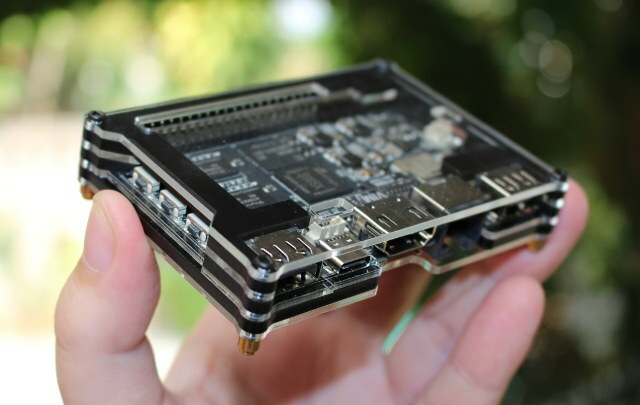 Khadas Vim is the only Amlogic S905X development board I’m aware of. There are 4 or 5 versions of the board, but currently only two models are sold: Khadas Vim with 8GB flash and single band WiFi + BLE 4.0, and Khadas VIM Pro with 16GB flash, and dual band WiFi + BLE 4.2. 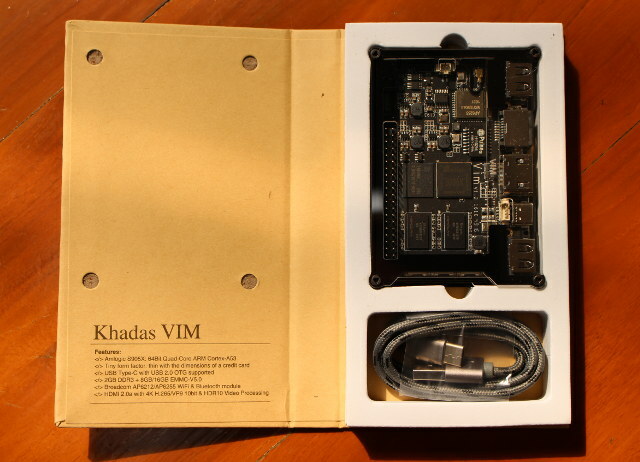 SZWesion, the company behind the board, has sent Khadas Vim Pro for evaluation. Today, I’ll take a few pictures of the board and its accessories, and report my experience playing with Ubuntu 16.04.2 on the board. They’ve also released Android, LibreELEC, and dual boot Android/Ubuntu (for Vim Pro only) images, which you can find in the firmware resources page. 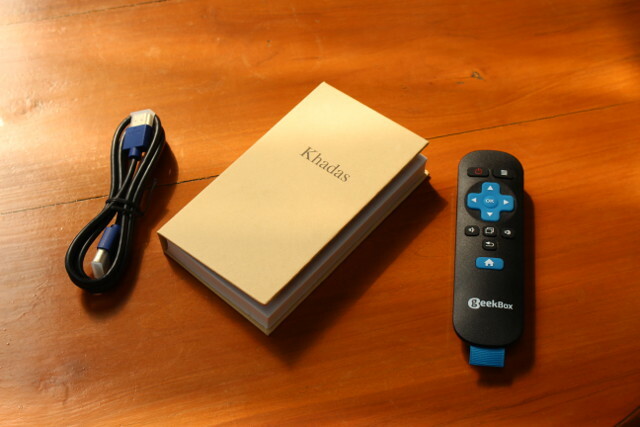 My parcel included Khadas package that looks like a book, an HDMI cable, and the same IR remote control sent with GeekBox, the first board made by the company, and powered by a Rockchip RK3368 processor. You can indeed open the package like a book, and you’ll find the board and a USB to USB type C cable inside, as well as some basic specifications. You can verify you’ve got the right model on that back of the package which shows the memory and storage, in my case 2 GB + 16 GB. The board comes with a neat acrylic case with opening for headers and ports. The top of the board features a 40-pin header, the Amlogic S905X processor (no heatsink), two RAM chips, the eMMC flash, the wireless module (AP6255), and most ports with two USB 2.0 ports, a USB type C port, HDMI 2.0a, and Fast Ethernet. There’s also a separate header close to the USB-C port giving access to Vin in case you don’t want to power your board through USB. There’s also 2-pin battery connector on the left of the board for the real-time clock (RTC). The bottom side of the board includes two more RAM chips, and the micro SD slot. While you can download the firmware on the “Firmware Resources” page, I recommend you check the Announcements & News section on the forums, as they normally include a changelog and some tips to configure your board. An Ubuntu 16.04 + XFCE image was released last month, but the company uploaded a Ubuntu 16.04.2 server image yesterday, so that’s the one I’m going to use today. A new Ubuntu 16.04 + XFCE image with better graphics support will be released sometimes next week.My plan is to do the update in my Linux computer. The firmware is distributed through Mediafire, so you’ll have to download it through your web browser. I also downloaded Vim_Uboot_170121.7z on the Firmware Resources pge since it’s needed for the SD card update method. Once we’ve got the firmware and U-boot binaries we can extract them with 7z. Now insert the micro SD card inside your computer, find the device with lsblk, and check if it has more than one partition. Replace /dev/sdX with your own device. If it has no partition or more than one, you’ll need to change the partition table using tools like fdisk, or gparted. The instructions provided on Khadas website are basically the same as I wrote in the post “How to Create a Bootable Recovery SD Card for Amlogic TV Boxes“. Now connect your board with the cables would want to use (e.g. Ethernet, HDMI. 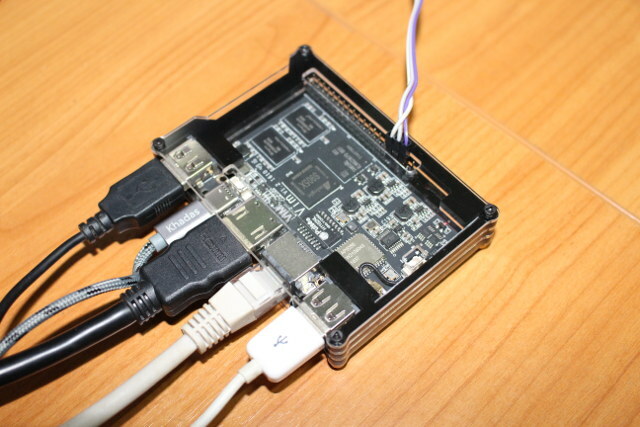 etc…), and possibly connect a USB to TTL debug board to access the serial console in case of errors. I also connect a USB hub with my RF dongles for air mouse, and a USB keyboard. 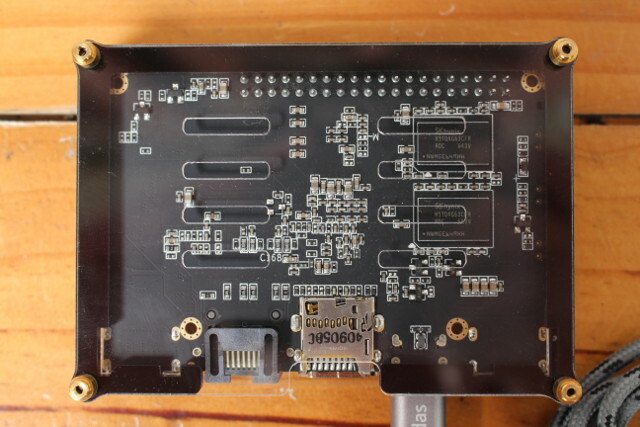 The board comes pre-loaded with Android 6.0.1 with Linux 3.14, so you can connect the power first to make sure the board is working properly. Note that you’ll need to provide your own USB power supply. I used a 5V power supply, and not a fast charger found in some phone and starting at 12V. Now we can insert the micro SD card we’ve just prepared into the board, and boot into Upgrade Mode by keeping pressing on the power button (closest to the 40-pin header), pressing a short time on the reset button (closest to the USB port), and releasing the power button two or three seconds later. 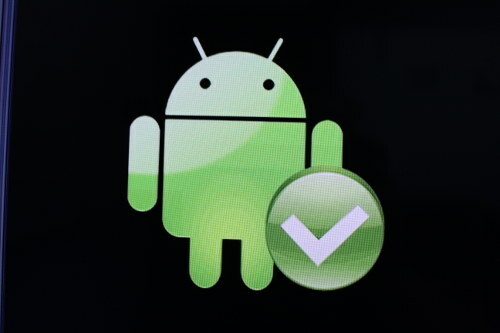 At this point, you should get a firmware upgrade interface on the HDMI display with a green progress bar, and once completed you’ll get a “Successful Android” logo. mmc_write_partition_tbl: mmc write partition OK! [MSG]stop here as poweroff and powerkey not supported in platform! I contacted SZWesion about the issue, and they told me the SD card method did not work despite being documented on their website, and I had to use Amlogic USB Burning Tool in Windows instead. So I fired up a Windows 7 virtual machine, and I had no problem (for once) flashing the “update.img” file extract from Vim_Ubuntu-server-16.04_V170211.7z to the board. BL2 Built : 13:48:56, Sep 23 2016.
get_dtb_struct: Get emmc dtb OK! mmc_read_partition_tbl: mmc read partition OK! eMMC/TSD partition table have been checked OK! [ 0.000000@0] Preemptible hierarchical RCU implementation. [ 0.000000@0] RCU restricting CPUs from NR_CPUS=8 to nr_cpu_ids=4. [ 0.000000@0] Architected cp15 timer(s) running at 24.00MHz (phys). [ 0.003493@0] device-tree: Duplicate name in /efusekey, renamed to "key0#1"
[ 0.003524@0] device-tree: Duplicate name in /efusekey, renamed to "key1#1"
[ 0.003542@0] device-tree: Duplicate name in /efusekey, renamed to "key2#1"
[ 0.003560@0] device-tree: Duplicate name in /efusekey, renamed to "key3#1"
[ 0.142967@0] SMP: Total of 4 processors activated. [ 0.557064@0] hw-breakpoint: found 6 breakpoint and 4 watchpoint registers. [ 0.563542@0] pinmux-gxl c1109880.pinmux: Init pinux probe! [ 2.219974@0] osd_rdma: osd rdma request irq as second interrput function! [ 2.220162@0] Advanced Linux Sound Architecture Driver Initialized. [ 4.075854@0] ESM HLD: Device range 'esm' has been registered. [ 4.087351@0] ESM HLD: The class /sys/class/elliptic has been created. [ 4.098360@0] ESM HLD: Device 'esm' has been created. [ 4.103209@0] ESM HLD: Done initializing the HLD driver. INFO: HDCP22 key read fail! [ 4.164293@0] storage: probe done! [ 4.293804@0] [aml_sd_emmc_probe] aml_sd_emmc_probe() success! [ 4.412613@0] [aml_sd_emmc_probe] aml_sd_emmc_probe() success! [ 4.502638@1] [aml_sd_emmc_probe] aml_sd_emmc_probe() success! [ 4.557041@2] [mmc_read_partition_tbl] mmc read partition OK! [ 4.558333@2] card key: card_blk_probe. [ 4.558341@2] emmc key: emmc_key_init:552 ok.
[ 4.558656@2] Exit aml_emmc_partition_ops OK.
[ 5.003479@2] codec:use cma buf. 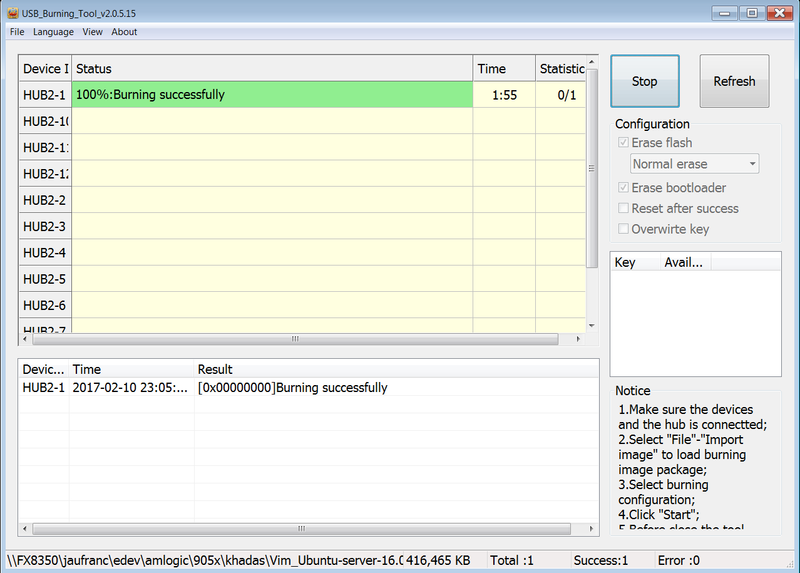 [ 5.005389@2] amvenc_avc_probe -- reserved memory config fail. [ 5.005420@2] encode start monitor. [ 5.005475@0] encode workqueue monitor start. [ 5.007822@2] codec:used fix clk for vdec clk source! [ 5.008088@2] DI: di_module_init ok.
[ 5.174153@2] DI: di_probe allocate rdma channel 1. [ 5.178980@2] DI: DI hw version 2. [ 5.269618@2] DI: di_probe here. [ 5.300512@2] efuse efuse.10: probe OK! [ 5.397144@2] amaudio: amaudio: driver amaudio succuess! [ 5.436302@2] ESM HLD: Device range 'esm_rx' has been registered. [ 5.448322@2] ESM HLD: The class /sys/class/elliptic_rx has been created. [ 5.459871@2] ESM HLD: Device 'esm_rx' has been created. [ 5.464925@2] ESM HLD: Done initializing the HLD driver. [ 5.476116@2] [viuin..]viuin_probe probe ok.
[ 5.586287@2] m1-adckp adc_keypad.48: adc_key: faild to get name_len! [ 5.591356@2] m1-adckp adc_keypad.48: home key(300) registed. [ 5.627506@2] gpio-key gpio_keypad.47: power key(116) registed. [ 5.640232@2] gpio-key gpio_keypad.47: gpio keypad register input device com. [ 6.110969@2] Netfilter messages via NETLINK v0.30. [ 6.121964@2] ctnetlink v0.93: registering with nfnetlink. [ 7.530477@0] gxbb_pm: enter meson_pm_probe! [ 18.388688@1] systemd: System time before build time, advancing clock. [ 18.435400@2] systemd: Detected architecture arm64. [ 18.464952@2] systemd: Set hostname to &lt;Khadas&gt;. [ 18.607307@2] systemd: Listening on udev Kernel Socket. [ 18.621312@2] systemd: Reached target Encrypted Volumes. [ 18.635218@2] systemd: Started Dispatch Password Requests to Console Dire. [ 18.652156@2] systemd: Set up automount Arbitrary Executable File Formats. [ 18.673088@2] systemd: Created slice System Slice. [ 18.687592@2] systemd: Reached target Slices. [ 18.702178@2] systemd: Created slice system-getty.slice. [ 18.716921@2] systemd: Listening on Journal Socket (/dev/log). [ 18.733344@2] systemd: Listening on Journal Socket. [ 18.767754@2] systemd: Listening on udev Control Socket. [ 18.785955@2] systemd: Starting Create list of required static device nod. [ 18.872178@2] systemd: Reached target Swap. [ 18.905466@2] systemd: Listening on /dev/initctl Compatibility Named Pipe. [ 18.973839@2] systemd: Started Forward Password Requests to Wall Director. [ 18.990741@2] systemd: Reached target Paths. [ 19.015435@2] systemd: Reached target Remote File Systems (Pre). [ 19.030544@2] systemd: Reached target Remote File Systems. [ 19.061197@2] systemd: Reached target Sockets. [ 19.076499@2] systemd: Created slice system-serial\x2dgetty.slice. [ 19.093753@2] systemd: Mounted Huge Pages File System. [ 19.107325@2] systemd: Mounted POSIX Message Queue File System. [ 19.121615@2] systemd: Mounted Debug File System. [ 19.135885@2] systemd: Started Create list of required static device node. [ 19.154920@2] systemd: Started Remount Root and Kernel File Systems. [ 19.170273@2] systemd: Started Journal Service. [ 19.801719@0] dhdsdio_probe : the lock is released. [ 20.005101@3] ionvid: info: ionvideo_stop_generating!!! !